Leo Galland MD, FACN – Under conditions of mental or physical stress, magnesium is released from your blood cells and goes into the blood plasma, from where it is excreted into the urine. Chronic stress depletes your body of magnesium. The more stressed you are, the greater the loss of magnesium. The lower your magnesium level to begin with, the more reactive to stress you become and the higher your level of adrenalin in stressful situations. 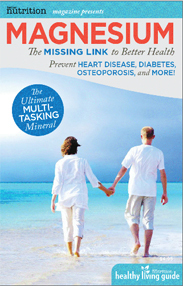 Higher adrenalin causes greater loss of magnesium from cells. Administering magnesium as a nutritional supplement breaks this vicious cycle by raising blood magnesium levels and buffering the response to stress, building your resistance.